When I first received this record, I thought, “Gee, could a record possibly be in worse condition?” I had purchased it for a cheap price knowing that it was heavily battered, which is pretty uncommon for me. I don’t often want to go down that road of buying records that are destroyed simply because they are rare. Not really my style. It has less to do with feeling high and mighty, and more about conserving space! However, this was Raoul Journo, perhaps the greatest male Tunisian singer ever, so I made an exception. It paid off in a way. Yes, this record is heavily worn, but it doesn’t sound nearly as bad as it looks, with its wasteland of grey grooves, thousands of scratches, its myriad of “digs.” Like everything else I offer on this blog, it has never been made available in any format as far as I know (although I’m betting he re-recorded it later in his long career). And, again – did I mention that this is Raoul Journo we’re talking about? In short: my apologies for the sound, but I thought it was worth it in this case. These are not common. 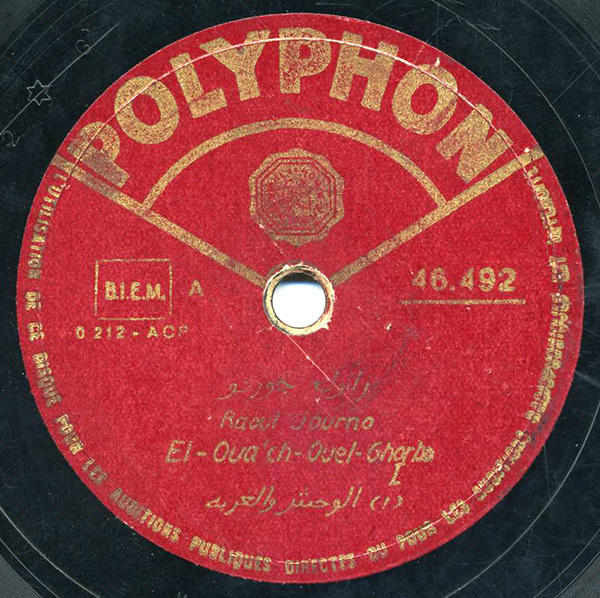 Journo (1911-2001) was a Jewish Tunisian singer, and I believe this stems from one of his earliest sessions, in 1935 for the Polydor company. He’s accompanied by percussion, violin, and oud – plus, there’s a nice qanún solo in the introduction. Also – I included BOTH sides of the record this time (Parts 1 and 2). For more of his work, try the Secret Museum’s fantastic North African compilation. This outfit offers some later releases, as does this one. And here’s another site of interest. He was indeed among one of Tunisia’s greats, if not the greatest vocal singer.